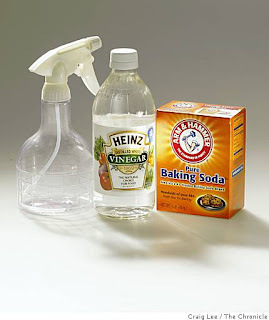 According to many experts White Vinegar has 1001 uses. It can be used in cooking and cleaning as well as gardening and home remedies. Many companies are "going green" with their chemicals to help protect the environment; however in the midst of doing so their chemicals are still very harmful to us and our bodies. White vinegar may just be our answer. I, personally, have begun using it in my own home and it definitely makes a difference. Tea Tree Oil also works very well alongside the vinegar. Both these products are also very, very inexpensive and can be purchased at almost any grocery store/ farmer's marketplace. Have a great white cleaning day!